Clinic Synopsis: Underdeveloped fundamentals impact greatly the overall success of any ensemble. For the young performer, productive practice can be a challenge! As teachers, we are responsible for providing them with valuable concepts to promote a straight forward method of practice …. a method to ensure that they get the most out of their work effort. The focus of this clinic is to help students develop sound practice skills, to learn to listen with more critical ears, and to ensure they are playing with maximum efficiency, with ease of tone production and natural resonance. Clinician Biographical Information Acknowledged as the first woman trumpeter in a major symphony orchestra, Marie Speziale retired from the Cincinnati Symphony Orchestra in November of 1996 after serving as its Associate Principal Trumpet for thirty-two years (1964-1996). In 1964, she graduated from the College-Conservatory of Music in Cincinnati with a Bachelor of Music degree where she studied with Eugene Blee. Other teachers include Robert Price, Robert Braunagel, and Arnold Jacobs. Her tenure with the CSO included playing with the Cincinnati Opera, Cincinnati May Festival, Cincinnati Ballet and Cincinnati Pops. Ms. Speziale performed under the batons of Igor Stravinsky, George Szell, Leonard Bernstein, Aaron Copland, Eugene Ormandy, Eric Leinsdorf, Max Rudolf, James Levine and Robert Shaw … to name a few. Her extensive performance experience includes solo appearances with the New York Orchestral Society, Tampa Philharmonic, Cincinnati Chamber Orchestra, Cincinnati Symphony, Cincinnati Pops, Cincinnati Pops with Duke Ellington, on the Dave Garroway NBC Today Show (age 15), with Dave Brubeck on the Johnny Carson NBC Tonight Show, with Dave Brubeck on the Cincinnati Symphony Orchestra European tour, and at the Interlochen Arts Academy. She has accompanied such artists as Isaac Stern, Itzak Perlman, Van Cliburn, Pincas Zukerman, Doc Severinson, Andy Williams, Jerry Lewis, Johnny Mathis, Natalie Cole …. and so many more. Since retiring from the orchestra, she has remained active as a performer, teacher and clinician. She has served as Visiting Principal, Associate Principal and Second Trumpet with the St. Louis Symphony Orchestra …. including recordings, Carnegie Hall concerts and their European Tour. She has performed with the Colorado Symphony and Louisiana Philharmonic. She toured with DIVA (the women's jazz band) and the Florida Symphony Orchestra. She recorded for the television series Star Trek: Voyager and Deep Space Nine at Paramount and 20th Century Fox studios. Ms. Speziale has been active as a clinician, as a participant in numerous conferences and has presented master classes in Europe, Japan and throughout the United States. She was a featured guest artist at the 1993, 1997, 2000, 2003, 2010 and 2014 International Women's Brass Conferences and the 1998, 1999, 2001, 2014 and 2015 International Trumpet Guild Conferences. She has served as artist faculty for the 1998, 1999 and 2000 Summit Brass Mendez Institute, performing with Summit Brass, coaching ensembles, presenting master classes and conducting brass orchestral repertoire reading sessions. In 1999, she was one of six Americans (and the only woman) to be invited by the Tokyo International Music Festival to perform in their first Super World Orchestra. Ms. Speziale also served as adjudicator for the National Trumpet Competitions held at George Mason University in 2000, 2001, 2003 and 2004. In 2004, 2010 and 2014, she served as judge for the prestigious Fischoff National Chamber Music Competitions. From 1964 - 1972, she was Adjunct Professor at the University of Cincinnati College-Conservatory of Music. From 1972-1979, she was Adjunct Professor at Miami University of Ohio, returning to the College-Conservatory as Adjunct Associate Professor from 1979 to 2002. She was appointed Professor of Music with tenure at Indiana University from 1999 to 2003. 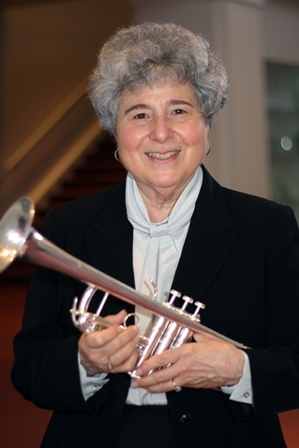 In 2002, Ms. Speziale was appointed with tenure to the faculty of The Shepherd School of Music at Rice University serving as Professor of Trumpet, Brass Department Chair and Conductor of the Rice Brass Choir. While living in Houston, she performed regularly as third trumpet with the Houston Grand Opera and frequently with the Houston Symphony, Houston Ballet and Houston Pops Orchestras. From 1997 to 2002, Ms. Speziale served as President of the International Women's Brass Conference and continued to serve on its Board of Directors until 2012. She has served on the Board of Directors of the Northern Kentucky Symphony Orchestra and on the editorial committee of the American Music Teacher, the official journal of the Music Teachers National Association. A member of the American Federation of Musicians, Ms. Speziale served as secretary and on the Board of Directors of Local #1 in Cincinnati, OH. She is also a member of the International Trumpet Guild, Sigma Alpha Iota and Pi Kappa Lambda. Honors and awards include Mortar Board, Leading Women in the Arts Award from the Greater Cincinnati Coalition of Women's Organizations, the Outstanding Woman of the Year in Music Award from the Tampa Tribune and the Sigma Alpha Iota Chapter Leadership Award, Province Leadership Award and National Leadership award. After graduating from CCM, she served as Province President and National Director of Instrumental Activities for Sigma Alpha Iota. Ms. Speziale has been a brass coach and has served on the audition adversity training panel with the New World Symphony. In 2005, she was invited to conduct the New World Symphony Brass Ensemble in their first concert of the season. From 2006 to 2008, she served on the faculty of the University of Cincinnati College-Conservatory of Music's Opera Theatre and Music Festival in Lucca Italy and in Spoleto Italy in 2010 and 2011. She conducted the CCM Lucca Brass Choir and CCM Spoleto Brass Choir, taught brass orchestral repertoire classes and served as brass chamber music coach. In 2011, she was a featured guest artist at the International Trumpet Festival at West Chester University where she also conducted the International Festival Brass Choir made up of professional brass players from around the world. In 2012, the US Air Force Band invited Ms. Speziale to come to Washington, DC twice to conduct, coach and present master classes for the band’s brass section and their Ceremonial Brass. In February of 2014, she conducted the US Army Field Band Brass (another Washington, DC premiere band) in concert. That same program was featured at the 2014 International Trumpet Guild Conference in Pennsylvania where Ms. Speziale was also a featured guest artist. In 2014, Ms. Speziale was presented with the distinguished Pioneer Award from the International Women’s Brass Conference. She conducted the Monarch Brass Ensemble in concert at their 2014 Conference and at the 2015 International Trumpet Guild Conference. She was presented with the Golden Rose Award from the Women Band Directors International at the 2014 Midwest International Band and Orchestra Conference in Chicago. That same year, she was elected to serve on the board of the American Classical Music Hall of Fame. In 2015, she received the Outstanding Alumnae Award from the College-Conservatory of Music and the Distinguished Alumnae Award from the University of Cincinnati. Ms. Speziale retired from her position at the Shepherd School of Music at Rice University with the distinction of Professor Emerita in 2013. She has served on the faculty of the Round Top Festival Institute in Texas since 2011. In 2014, she was appointed Adjunct Professor of Music at the Jacobs School of Music at Indiana University where she coaches graduate brass chamber music.